Ulster Unionist leader Robin Swann says any new legislation on the Irish language would lead to further division in society in Northern Ireland. Mr Swann was addressing his first UUP conference since taking over from Mike Nesbitt as leader. The North Antrim MLA denied lurching to the right over the Irish language. He insisted the UUP's position has not changed since 1998. Mr Swann told his supporters that the party has no issue with those who cherish the Irish language. However, he insisted it is not scaremongering to be concerned about the impact of an Irish language act. He said that if one is passed, people would no longer be reliant on flags or painted kerbstones - instead they would know whose territory they were in by looking at the road signs. It's understood that differences over the shape of future legislation regarding the Irish language and other cultural matters are central to the stalemate in the talks between the DUP and Sinn Féin. So far as those talks are concerned, the UUP leader expressed annoyance that progress is - in his view - being held up because Sinn Féin "is being swung by the tail by a TD who has no mandate in Northern Ireland" - a reference to Gerry Adams. Mr Swann did not mention the DUP by name during his conference speech. However, he did tell his supporters that "there's only so many Spotlight specials people can take before they look for an alternative". Mr Swann also talked about what he referred to as the relationship between "political unionism" and paramilitaries. He said his party would not provide political cover for any group to be "community workers by day and extortionists or political bullies by night - loyalist or republican". He said the UUP would not "trade our principles for possible cheap electoral gain by buying votes, while turning a blind eye or ignoring unacceptable practices which continue to cause sheer misery" within local communities. 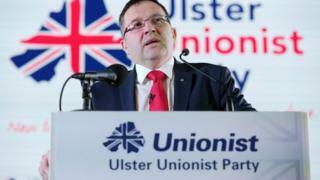 The UUP lost six seats in the Northern Ireland Assembly election in March, followed by May's general election in which its two MPs were unseated. Not for the first time there are questions over its survival. For decades it had been Northern Ireland's biggest political party. Mr Swann became UUP leader after the resignation of Mike Nesbitt following the party's poor showing in the assembly election. He has ruled out a merger with the increasingly dominant Democratic Unionist Party. He has previously blamed a polarised electorate and a reduction in the overall number of MLAs from 108 to 90 for his party's struggles.